My narration of SON of Gun in Cheek! Twice the funny! 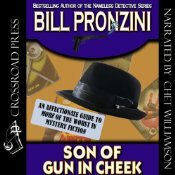 If Bill Pronzini’s Gun in Cheek tickled your literary funnybone, Son of Gun in Cheek, the sequel, will cause even more chortles, guffaws, titters and heehaws…Once again, I got to narrate the unabridged audiobook of one of my favorite hilarious books, a compilation of hundreds of excerpts from the worst mystery novels ever published. Bill Pronzini can really pick ’em, and it was a sheer delight to read (when I could keep from cracking up). If readers think some self-published ebooks are bad, wait till you read the stuff that publishers actually paid money for! Cheap, downloadable, hilarious — what more could you want? Go get it: here!